We also offer a full Accountancy and Book-keeping Service . We can handle your Book-keeping, Management Accounts, VAT Returns, Budgets, Cashflows, Monthly Accounts, Year End Accounts, Self Assessment Tax Returns, Corporation Tax Returns. Quickbooks Book-keeping Service We can provide a full or partial Book-keeping and Accounting service using Quickbooks. We can do as much or as little as you wish, we can maintain all your book-keeping or you can do some of it yourself and leave us to do the tricky bits like Bank Reconcilations, VAT Returns and full Monthly Management Accounts. simply contact us with your requirements. We are qualified Financial Accountants. Martyn A Smith A.F.A. Incorporated Financial Accountant. See www.ifa.org.uk for more information. We are Qualified Accountants and we offer a full Accountancy and Taxation service for Individuals, Charities and Small and Medium Sized Businesses. Whether it be a self assessment Tax Return. A full set of Accounts for Companies House for your Limited Company and CT600 Corporation Tax Return or Management accounts for your growing business we can help you. See our Accountancy site for more information or Contact us here for more details. We can either offer you training in Quickbooks payroll or we can take over the whole area for you. We run a Payroll service if you have less then 50 employees. Maybe you are happy to do the basic book-keeping on Quickbooks, with use of the integrated Accountants Review facility we can handle the VAT Returns, Management Accounts and Year End accounts transferred very cleverly to us with the Accountants Review facility whilst allowing you to continue using your Quickbooks program for day to day book-keeping. Contact us for a free no obligation quotation free of charge and let us help with your business. Contact Us. 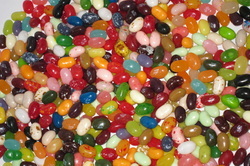 You will want to know whether your Red Jelly Beans make more profit than your Green Jelly Beans... See The Mobile Accountant and contact us further to see how we can do so much more than just count beans for you..